Likud Minister responds after his loss in the elections for mayor of Jerusalem. 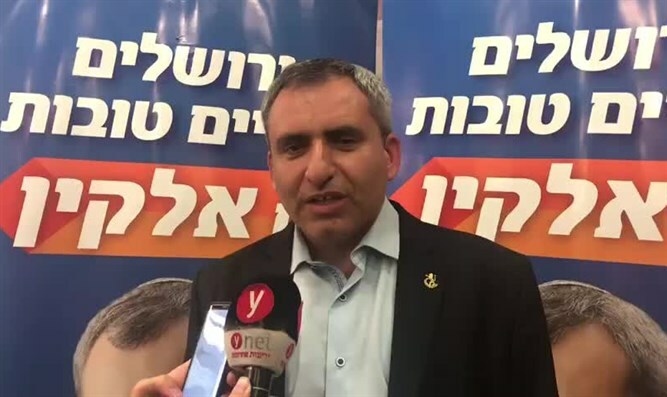 Minister of Jerusalem Affairs and Minister of Environmental Protection Ze’ev Elkin (Likud) responded on Tuesday night to his loss in the elections for mayor of Jerusalem and made it clear that he did not regret having embarked on the arduous journey. With 80% of the votes having been counted, mayoral candidates Moshe Lion and Ofer Berkovitch each won 30% of the votes and will participate in a runoff in two weeks. Elkin received 20% of the votes. “The results are clear. In politics one needs to also know how not to win. Until today I always won, one also needs to know how to lose sometimes. I congratulate Moshe Lion and Ofer Berkovitch, who advanced to the second round. Whoever is victorious, I, as minister of Jerusalem, will cooperate fully with him and I will do everything to advance Jerusalem," Elkin said. "I would like to thank the people who went out with us on this journey: to the prime minister who stood behind us, to the Likud ministers and the Jewish Home ministers, to the Speaker of the Knesset, to the outgoing mayor Nir Barkat, and first and foremost to my partners in the journey: The members of the list, the city council members who enlisted with all their might, the activists and the faction that will enter city council and will continue to ensure the development of the city," continued Elkin. "I do not regret for a moment that I went on this journey, we believed in a path, we took a courageous act and a certain gamble. But when you believe in something in public life you have to know how to go about it and accept the decision of the voters," Elkin said.